Can You Afford to Have a Baby? Many American families today have two working parents contributing to expenses like groceries, car payments and mortgage payments. However, a growing number of families have made or are making the transition to living on one income. According to Pew Social Trends, in 2012 there were 10.4 million stay-at-home mothers. Another study by the research group found in the same year 2 million stay-at-home fathers. Still more couples without children are paying their expenses through one paycheck. For some this is a choice ,while for others it is the result of a layoff. In any case, the transition from two incomes to one can be a difficult one if the family is unprepared. If you know about the transition to one income months in advance, it will be helpful to begin practicing the one-income life before it's needed. Bank of America suggested doing this at least six months before the final paycheck comes for the partner leaving the workforce. This way, cutting expenses won't come as such a big shock. If reducing spending is harder than you thought, the second income, while still available, will act as a safety net. Or, if everything transitions smoothly, this money can be used as your family's emergency fund. Getting prepared isn't the only thing couples need to plan before downsizing to one paycheck. It is essential to lay out all expenses and see what is necessary and where you can cut back. Parents.com explained grocery expenses can be downsized by planning meals, avoiding precooked meals and clipping coupons for groceries you already planned on buying. Sarah Prince, a working mom whose husband stays at home with their three small sons, told the Huffington Post they use a Costco executive membership to purchase expensive necessities, like diapers. Getting 2% back on her pricey purchases covers the cost of the membership and saves her money. 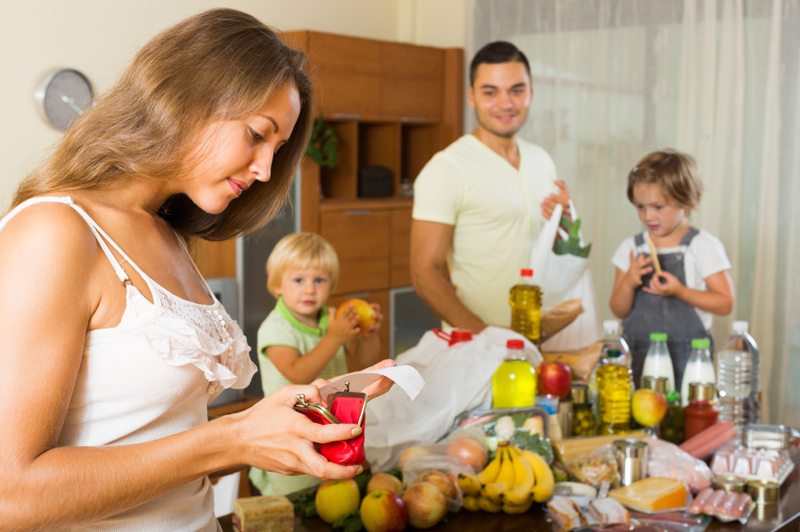 "Grocery expenses can be downsized by planning meals, avoiding precooked meals and clipping coupons"
Before making the switch to a one-income life, it's important that both partners have a clear understanding of how it will work. Ben Gilbert, an Oregon-based financial planner, told Bankrate some couples feel uneasy about living off of one person's income because it raises questions of ownership and who has the right to make financial decisions. It's important this doesn't become an issue as it can lead to tension in the relationship. Gilbert suggested planning a monthly allowance for both partners to spend. This way, each person knows how much money is "theirs" and the rest goes toward mutual expenses, like bills, or into a mutual savings account. Bank of America explained there are many ways couples can come to a decision about handling money. Some decide that the person who stays home is the one who manages the finances because he or she has more time. Others choose to have joint checking accounts to transfer money from one to the other when needed. No matter what you and your partner decide on, it is important that any negative feelings are resolved and any confusion is cleared up. Going into a one-income lifestyle together should be a team effort, with each partner happy with their role in the relationship. There are many unexpected ways to save money. Bank of America suggested one-income families look into tax withholdings. Talking to a financial planner or getting in touch with the IRS can help couples determine whether they can be moved to a lower tax bracket and if the withholdings from each check can be reduced. Parents.com advised couples check out any home-related tax breaks they could be eligible for. For instance, Bankrate.com explained the interest on your mortgage is deductible for loans under $1 million. Tax breaks aren't the only way your home can save or make you money. Bankrate.com explained that renting out an extra room can bring in another income stream, which can then be put into an emergency fund or help with some expenses, like health insurance. However you and your partner decide to do it, living off one income is possible. All it takes is some budget cutting, planning and clear communication. For more tips on personal finance and budgeting consider subscribing to our email list and get them sent to your inbox!